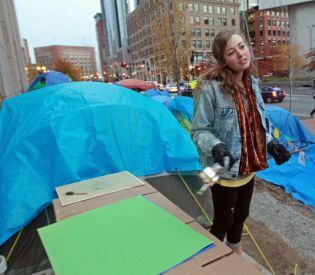 Occupier Bianca Piemonte, 21, above, will be spending Thanksgiving with family away from tent city (photo courtesy of the Boston Herald). I JUST WANT TO TELL EVERYONE TO HAVE A FANTASTIC HOLIDAY…HOWEVER YOU SPEND IT!!! Merry Xmas (or what ever you celebrate) and have a safe new year! All I can ask for this new year, is that I don’t lose anyone else close to my heart. I miss you daddy! Sorry.. it just came out.